This mozzarella burger is great for vegetarians and people trying to stay healthy. Mozzarella chesse has low fat versions which are both nutritious and healthful — a one ounce serving of part-skin mozzarella has 72 calories, 7 g of protein and a good source of calcium. If you want to avoid dairy products, you can substitute Tofu. 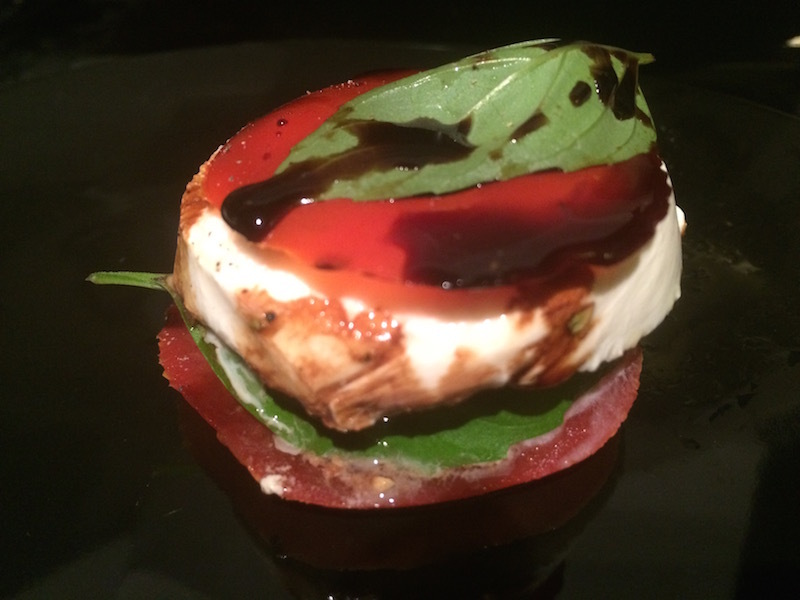 For the veggie salad burger shown above, we used sliced mozzarella, fresh basil leaves, a high quality balsamic vinegar, olive oil, oregano and salt & pepper. This salad can be ordered at some restaurants but you’ll definitely pay more and you won’t have control over the ingredients, type of cheese used (regular or low fat) or how much olive oil is added. It’s so easy to make these, there really isn’t a reason not to. Creating a delicious healthful salad at home is quick and easy. Simply select good quality ingredients and layer them one over another. The best salads consist of the freshest ingredients and it’s best to serve them crisp and cool. Select ingredients that are “in season” and preferably from local sources. Not only will you save money, but vegetables and fruits from local sources spend less time in transit and use less energy. In my last post I mentioned “fake” organic products from unknown sources. If you buy your food from local farmers, you’re not only reducing the chances of consuming foods from unknown sources but you’re also putting money back into your own local economy. Salads are a great way to eat healthfully but they can get boring if you never change the ingredients which is why it’s a good idea to experiment with different combinations and compositions. Never underestimate the value of creating a dish that looks as beautiful as it tastes. There’s no reason why a dish prepared in your kitchen shouldn’t look as good or better than one prepared at a restaurant. Restaurants are a great option for foods that require multiple ingredients and time-consuming preparation. They are also a great place to go for new ideas. If you eat out and find something great, don’t hesitate to take a photo and write it down. If you really love a certain dish, some restaurants will give you the recipe or may have a cookbook for sale. Life is too short not to enjoy every meal, whether dining out or at home. If you love great bread, then you need to read this.